At John's Waterproofing, we specialize in crawl space problems of all types. We offer free crawl space repair quotes in the Oregon area, including areas like Salem, Beaverton, Eugene, Portland OR, Vancouver WA. Dirt crawlspace needing a little makeover. The customer now has a usable storage space and a healthier environment. would you store things down here? After our cleanspace system you can. This crawlspace was dirty, musty and full of stagnant wet air. 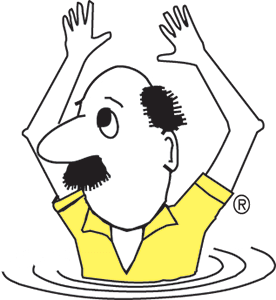 Our team came in and removed the debris from the crawlspace, provided appropriate drainage and completed the system with our patented SaniDry dehumidifier. 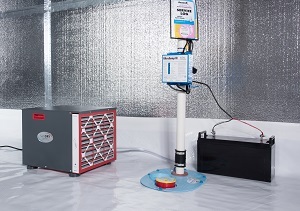 Now the air in the home is cleaner and healthier and the crawlspace is safe from mold and rot. Next week this crawlspace will receive spray foam insulation to better regulate the homes temperatures and increase energy efficiency throughout the home. Our team at John's Waterproofing completely transformed this crawlspace by waterproofing it with our patented CleanSpace encapsulation system, a Super Sump pump, and a SaniDry dehumidifier. This Crawlspace had no Vapor barrier and water issues. We fixed that by encapsulating it with CleanSpace! 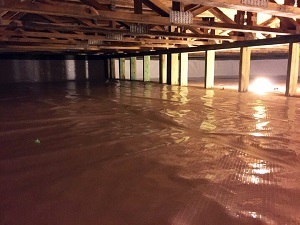 Building code requires crawl spaces to meet certain depth standards depending upon your town, which is why John's Waterproofing provides expert crawl space excavation services. If your home's crawl space isn't up to code, we can dig out up to 3 feet to help you meet local standards. This process is important to your home's long-term structure, and meeting code requirements is absolutely essential if you're planning to sell your house. We can evaluate your home and ensure that you meet the code standards required for your crawl space. At John's Waterproofing, we use and recommend products developed by the Basement Systems® International network of waterproofing contractors. In business since 1987, Basement Systems® operates a full Research and Development department, constantly searching the industry for the best, most proven products for lasting crawl space solutions.